On this luxury New York City dinner cruise, savor gourmet cuisine and enjoy live entertainment while soaking up breathtaking views of the Manhattan, New Jersey and Brooklyn skylines. 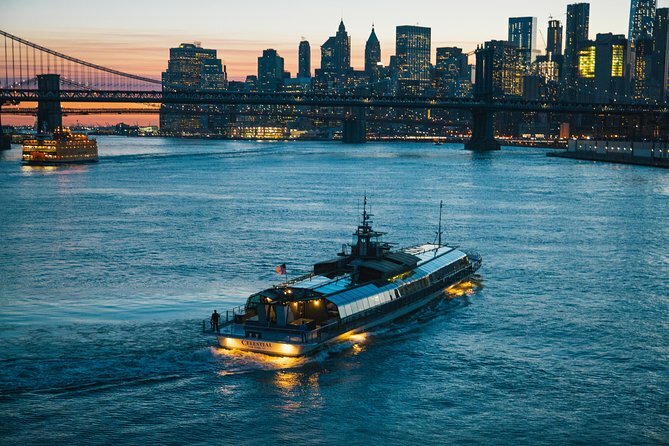 Sail right by the Empire State Building, Battery Park, Statue of Liberty, South Street Seaport and more from the viewing decks or the fully-glass enclosed cabin, treating you to amazing views every second of your time on board. Upgrade to enjoy a romantic or first class VIP experience including a private table and a chilled bottle of Champagne! - Dress Code will be enforced: For women, cocktail wear, a dress or dressy-casual attire is appropriate. For men collared shirts and dress pants; a jacket is requested. We strongly discourage casual jeans, t-shirts, shorts, athletic shoes or flip flops at any time. - Infants are not suitable for this cruise: Bateaux Dinner Cruises feature a sophisticated atmosphere. Children under 6 are not permitted and we do not offer a discounted rate for children. Head to Chelsea Piers in the evening to board your luxury cruise, an elegant fully glass-enclosed vessel and a deck layout that ensures every table a great view of the live entertainment. Get cozy in the climate-controlled cabin or head to the two outdoor viewing decks as your experienced captain guides you along the Hudson River, New York Harbor and East River. The moment you step aboard, live entertainment performed by talented musicians provides the perfect ambiance for sipping drinks and admiring the Manhattan skyline. Get up-close views of the Empire State Building, One World Trade Center (Freedom Tower), Battery Park, Colgate Clock, Governor’s Island, South Street Seaport, the Brooklyn Bridge, Brooklyn Heights and the Manhattan Bridge. Have your camera ready as you cruise by Ellis Island and the stately Statue of Liberty! As the magnificent skyline spreads before you in all directions, you’ll be served a gourmet dinner at your table (see Itinerary for sample menu). Uniquely designed seating arrangements create an inviting and intimate dining experience. After dinner, the live entertainment resumes. The evening crescendos with upbeat dance music from the Big Band era to Motown to today’s favorites. Dancing on the spacious hardwood dance floor is encouraged, and musicians are happy to accept requests! For a more romantic experience, enjoy your dinner at a private table just for you and your sweetheart. Admire your table's half-dozen roses, and pop open a bottle of champagne to toast to this magical evening with two keepsake souvenir Champagne flutes. Upgrade to First Class for the ultimate luxury experience! Sip a cocktail from the premium open bar and enjoy an amuse bouche (palate teaser) at your own private table before dinner. With this option, an exceptional evening becomes a true VIP event. Not cheap but worth every penny-amazing staff, very accommodating, Good class of guests. Food was surprisingly good as well. The perfect water experience. I will be back! Excellent dinner on board the boat as we sailed past the Statue of Liberty and viewed Manhatten high rises from the water. Well worth the trip. Awesome experience! The staff is great, the food is delicious, the experience is great! Well worth the money! What a wonderful evening, great dinner cruise. Fantastic evening. Lovely food and helpful staff. Great views from boat no matter where you sat. Would recommend and take this trip again, but it is cold in February so make sure you have a coat if you want to go outside to take pictures! This was one of the highlights of our 5 week holiday. The Boat ride and the dinner was very very good and very relaxing. We took this tour in winter so it was very cold, however the food was hot and lovely.